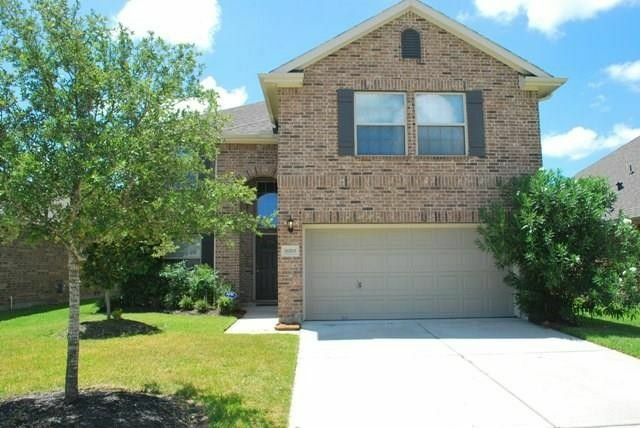 This lovely 4 bed 2.5 bath home is a wonderful find! JUST UPDATED CARPET! Upon entry you are greeted by an elegant formal dining room with tile flooring & direct access to the kitchen, making it the perfect space for all your entertaining needs! After passing the dining room you come to a spacious family room featuring a soaring two story ceiling, tile floors & large windows that shower the room in natural light! Creating your favorite recipes is a real treat in the beautiful kitchen equipped with tile backsplash/flooring, corian countertops, two pantries, a large central island & ample cabinet space! At the end of the day, withdraw to the spacious downstairs master suite complete with a luxurious bathroom showcasing a walk-in closet, double sinks, a whirlpool soaking tub & a walk-in shower! Upstairs is a huge centrally located game room & all 3 of the secondary bedrooms! The backyard has plenty of green space for outdoor activities & a covered patio! Don't miss out on this one! Directions: From US 290 W, travel south on Barker Cypress, Left at Queenston Blvd., Left on Whitaker Creek Dr., Left on Gammon Oaks Dr., Right on Berkshire Forest Dr., - house on right.